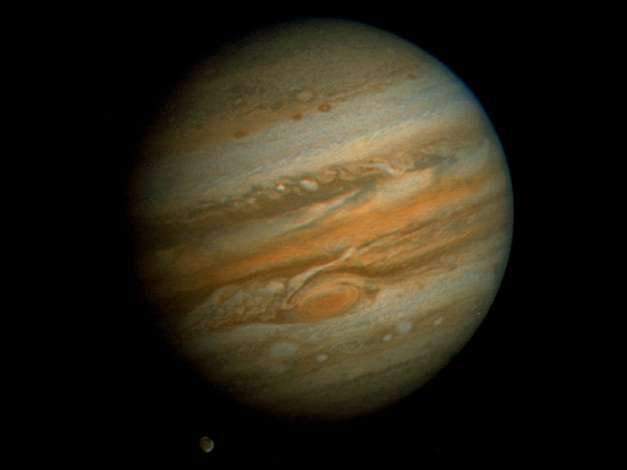 Information: Voyager 1 took this photo of the planet Jupiter on January 24, 1979, while still more than 25 million miles (40 million kilometers) away. The Great Red Spot shows prominently below center, surrounded by what scientists call a remarkably complex region of the giant planet's atmosphere. An elongated yellow could within the Great Red Spot is swirling around the spot's interior boundary in a counterclockwise direction with a period of a little less than six days, confirming the whirlpool-like circulation that astronomers had suspected from ground based photographs. Ganymede, Jupiter's largest satellite, can be seen to the lower left of the planet. Ganymede is a planet sized body larger than Mercury. This color photo was assembled at Jet Propulsion Laboratory's Image Processing Lab from three black and white images taken through filters.